The RL-8500 truck adapter package upgrades your RL-8500 brake lathe into a fantastically versatile truck servicing dynamo. 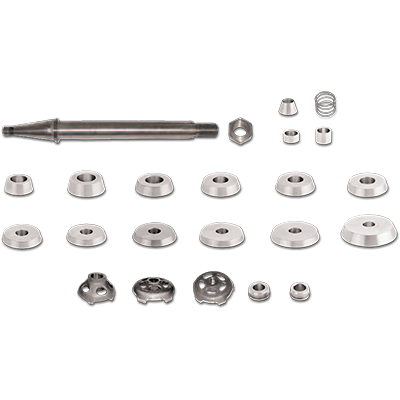 This super-duty, brake lathe truck adapter package consists of an upgraded 47.6 mm arbour and a wide variety of adapters. This enormous, multi-piece brake lathe truck adapter set allows you to expand your brake service coverage on the RL-8500 brake lathe and handle virtually any vehicle, all the way through 1-tonne trucks! Let no level of brake service exceed your capabilities with this exclusive set of Ranger’s truck adapters.